Big Kahuna Snakes & Ladders is an online video slot machine game released in July 2008, and it is offered exclusively at online casinos powered by Microgaming. This online video slot game has 5 reels and15 pay lines. Big Kahuna Snakes & Ladders is a sequel to the popular online slot game Big Kahuna, which mainly has a Hawaiian theme; but this time, the game is also incorporated with the children’s classic game of Snakes and Ladders. Since the Big Kahuna online slot game has been a constant favorite with online slot gamers, the Big Kahuna Snakes & Ladders will surely attract more players – previous and new ones alike. What most people like best about the Big Kahuna Snakes & Ladders online video slot game is that it is a mixture of two wonderful games – a video slot and the kiddie classic Snakes and Ladders game – topped with a fruity sweet 30,000 coin payout! Microgaming online slot games are available to players in 2 formats – download and no-download. Whether you like to download their software first or you prefer to play instantly without the need to download, then Microgaming surely has online slot machine games to accommodate your every slot gaming preference. Good thing that Big Kahuna Snakes & Ladders is available for instant play, so you do not have to download anything to find out if this game interests you in a way that you would like to spend some real money on it. Big Kahuna Snakes & Ladders is for players who like the classic game of snakes and ladders and for those who also like the “Lilo and Stitch” Disney animated series. 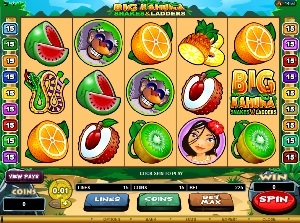 The Big Kahuna Snakes & Ladders online video slot game features scatter wins, a wild multiplier symbol, 2 fun Bonus Feature games (Snakes and Ladders Bonus Feature game and the Random Free Spin Bonus Feature game with 2x multiplier), a maximum coin jackpot of 30,000, and a maximum cash jackpot of $7,500! The graphics and sound quality that Microgaming provides is absolutely brilliant and top notch. They have a terrific reputation of making the most stunning graphics and marvelous sound effects that will truly transport you to “that specific theme” they use in any of their slot games. Most people love to play games run by Microgaming software because they have smooth animation and engaging yet non-interfering sounds. In Big Kahuna Snakes and Ladders, players are transported somewhere in Hawaii so they can enjoy some Hawaii-style slots action coupled with the very popular children’s game Snakes and Ladders! The symbols are well made and the boy and girl almost look like the characters from the Disney animated series Lilo and Stitch. The background of the reels is simple and is a solid peach color, so you can enjoy hours of slot action without straining your eyes. The overall graphic design of Big Kahuna Snakes & Ladders shows different colors such as green, blue, yellow, purple, orange, pink, red, white and black. Relaxingly slow jungle sounds (drums) with chirping birds and singing crickets can be heard while playing the Big Kahuna Snakes & Ladders online slot game. Smashing drum sounds is programmed whenever you get winning combinations with the Wild symbol. Tinkling sounds will be heard when you form winning combinations with the fruit symbols. There are no card deck symbols available in the Big Kahuna Snakes & Ladders online video slot game. The regular symbols that you will find in Big Kahuna Snakes & Ladders online video slot game are the Mask, Duzi (boy), Keira (girl), Komodo Dragon, Monkey, and fruits such as the Orange, Kiwi, Litchi, Melon and Pineapple. The Wild Symbol is the Big Kahuna Snakes & Ladders Logo symbol. It is a wild multiplier symbol. Thus, the Big Kahuna Snakes & Ladders Logo wild symbol not only acts as a substitute for all other symbols (except for the Scatter symbol) in order to you help you form winning combinations, but it also can multiply the payout! The Big Kahuna Snakes & Ladders Logo wild symbol doubles (multiplier x2) the payout of any winning combination it completes, as long as it acts as a substitute symbol. You are paid varying prize amounts (refer to the Payout table) when you manage to form a winning combination with multiple Big Kahuna Snakes & Ladders Logo wild symbols on an enabled pay line. Take note that the Big Kahuna Snakes & Ladders Logo wild symbol winning combination payouts are not doubled. Many slot players love the Big Kahuna Snakes & Ladders Logo wild symbol because it pays out a 4x Multiplier value when substituting during the Free Spin Bonus Feature games. The Scatter Symbol is the Snakes and Ladders symbol. Scatter symbols are not required to appear in a line (on an enabled pay line) for you to win. The Snakes and Ladders scatter symbol only appears on the 1st, 3rd and 5th reels, and you are able to complete winning combinations as long as there are 2 or more Snakes and Ladders scatter symbols that come out. Your winnings are calculated by multiplying the Snakes and Ladders scatter symbol combination payout (refer to Payout table) by the total number of coins you’ve bet. When the Snakes and Ladders scatter symbols appear anywhere on the 1st, 3rd and 5th reels simultaneously, you will activate the Snakes and Ladders Bonus Feature game. Please take note that if you get a scatter win and a regular win, then you are paid out for both of these wins, because the Snakes and Ladders scatter symbol is not required to come out on an enabled pay line for you to win. Scatter awards are independent from pay line awards and so they are added to the pay line win. The Free Spin Bonus Feature game of the Big Kahuna Snakes & Ladders online slot game is randomly activated. When activated, you will be given 5 Free Spins wherein all of the winning combinations you form during these Free Spins are doubled (multiplier x2)! All of the best and the pay lines played in the Free Spins are exactly the same as the game that activated the Free Spin Bonus Feature game. Please take note that if you activate the Free Spin Bonus Feature game and the Snakes and Ladders Bonus Feature game at the same time on a single spin, the Snakes and Ladders Bonus Feature game is played first. While in the Free Spin Bonus Feature games, the Big Kahuna Snakes and Ladders Logo symbol will award you a 4x multiplier amount when substituting for all winning combinations during the Free Spin rounds. The Free Spin Bonus Feature game cannot be re-activated while playing the Free Spins. But you can activate the Snakes and Ladders Bonus Feature game while playing the Free Spin Bonus Feature game. When the Free Spin Bonus Feature game is over, you will be then taken back to the main Big Kahuna Snakes & Ladders online slot game, and your winnings from the bonus game will be included to your overall balance. When you get the Snakes and Ladders scatter symbols to come out anywhere on the 1st, 3rd and 5th reels simultaneously, you will activate the Snakes and Ladders Bonus Feature game. In the Snakes and Ladders Bonus Feature game, the goal is to progress up the board as far as possible and retrieve the stolen Big Kahuna Tiki Mask. The last square you land on, after using up all of your rolls, is the Bonus Multiplier amount that you will win. The Bonus Multiplier amount will be then multiplied by your total bet amount. You can win up to 100x multiplier amount in the Snakes and Ladders Bonus Feature game! To play the bonus game, simply roll a dice to reveal the number of squares you can move. Each square you land on will determine the current bonus multiplier amount that you can win. There are 5 dice shown to you, and you can roll each dice only once. If you roll a 6, you are rewarded a free roll (rolled automatically). You are rewarded only a max of 2 free rolls per dice. If you land on the beginning of a ladder, you move up the ladder, bypassing the squares in between. If you land on the head of a snake, you move to the square where the snake’s tail ends. Please take note that at any point in the bonus game, you can choose to collect your current winnings. If you do so, this will end the Snakes and Ladders Bonus Feature game. Also, if you activate the Free Spin Bonus Feature game and the Snakes and Ladders Bonus Feature game at the same time on a single spin, the Snakes and Ladders Bonus Feature game is played first. When the Snakes and Ladders Bonus Feature game is over, you will be then taken back to the main Big Kahuna Snakes & Ladders online slot game, and your winnings from the bonus game will be included to your overall balance. Big Kahuna Snakes & Ladders has 5 reels where you may bet on 15 pay lines. The minimum bet is 0.01 and the maximum bet is 0.25 per pay line. You can wager 1 up to 20 coins per pay line bet. Therefore, the maximum bet amount is 75.00 per spin. Please take note that the amounts mentioned are in Pounds, but they will remain the same if you choose to play in US dollars, Euros, or Canadian dollars. Also, for every coin that you wager, you will enable another pay line. You will be paid out for winning combinations on enabled pay lines only. The maximum payout in the regular Big Kahuna Snakes & Ladders online video slot game is 5,000 coins per line bet. Online slot players who regularly play online casino games evidently love to stay longer on online slot games that have an Autoplay function. Good thing that Big Kahuna Snakes & Ladders is equipped with this function! In Microgaming online slot games, they have 2 game modes – Regular mode and Expert mode. You can have the game spin automatically for you with the Autoplay function that can be found by clicking the Expert button (if you look closely at the brown line at the bottom part of the game screen, you will see the Expert button just below the Bet Max button). After customizing the Autoplay function to your preferences, just click on the Start button, and the game will automatically spin for you while you just sit back, relax, and enjoy playing this tropical Hawaiian jungle adventure-filled online video slot game!